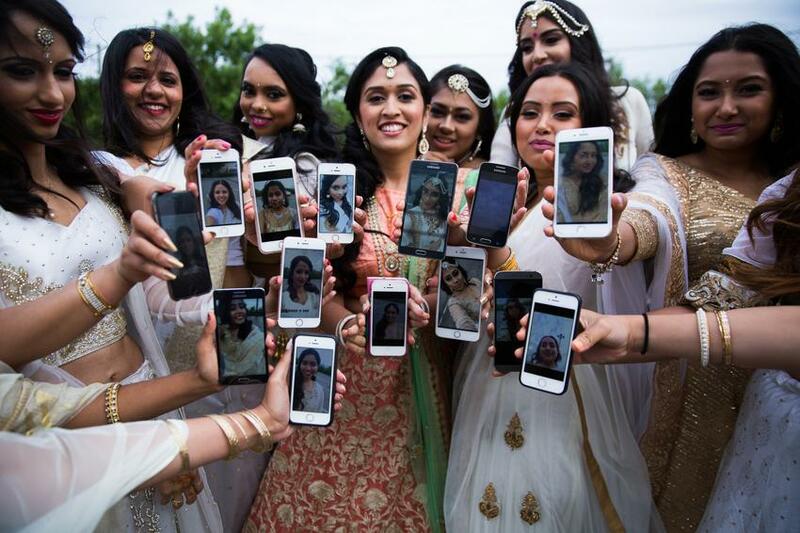 Bengali weddings are very colorful and fun-filled. 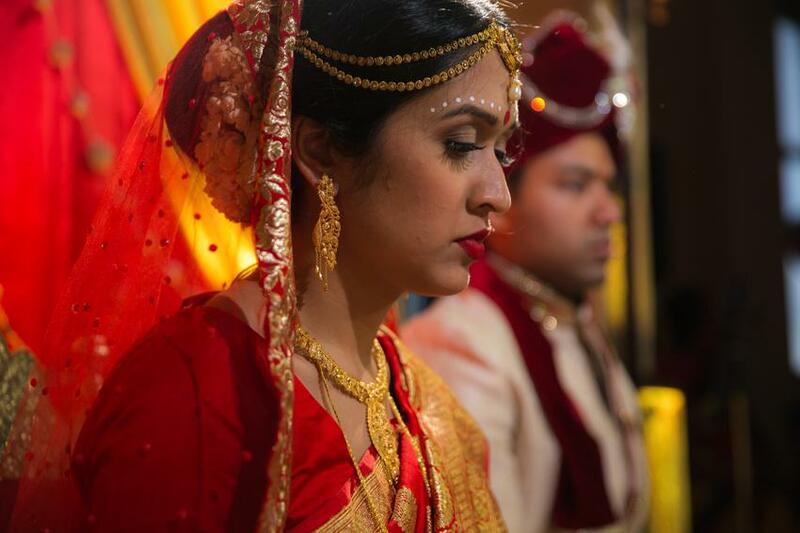 The Alfaaz team had the opportunity to be a part of a traditional fun-filled lavish Bengali wedding. 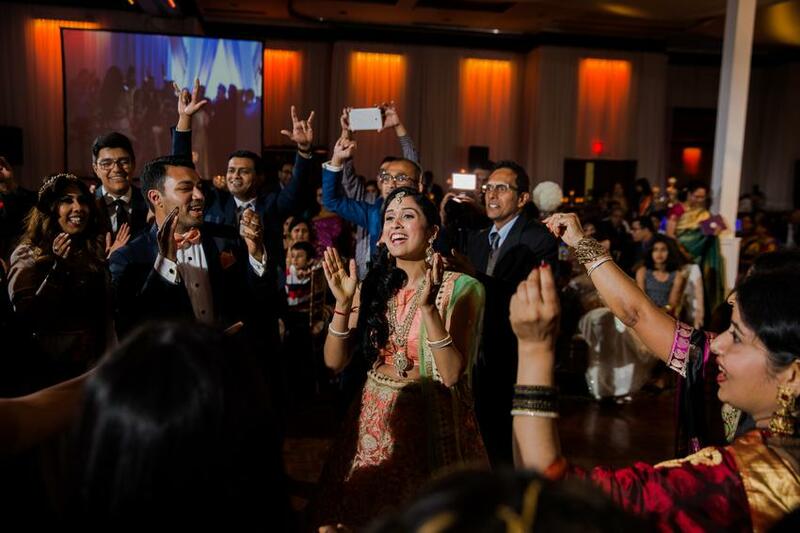 It was a big affair with over 1200 guests. 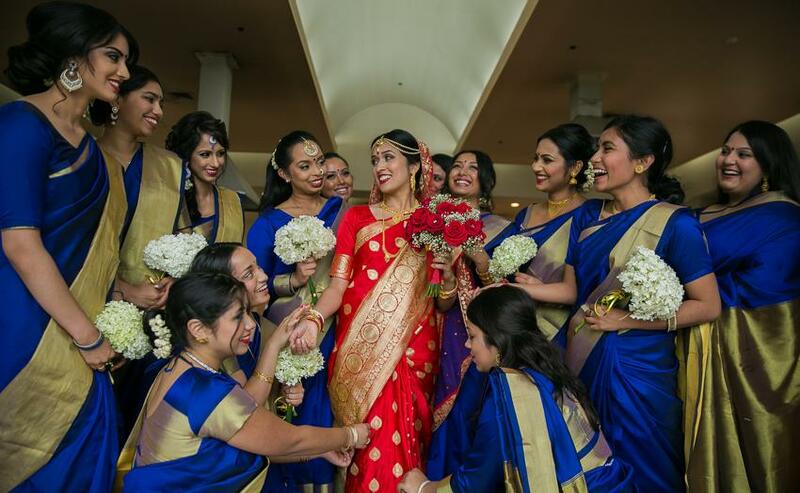 With all the love from family and friends, the wedding ceremonies were full of festivity. 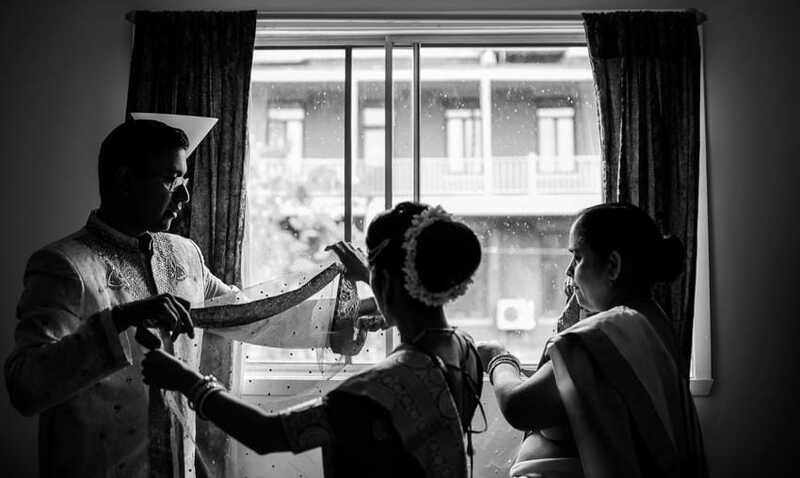 Bengali traditions were followed throughout the wedding. 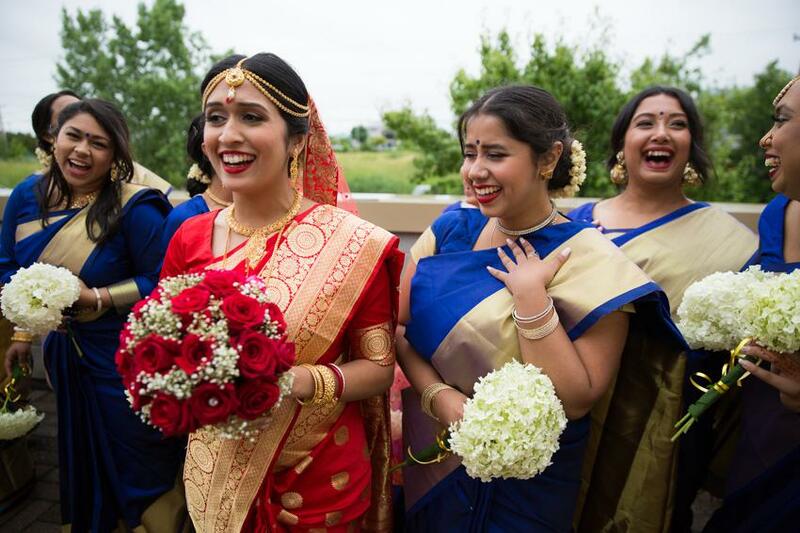 One of the traditions we learned about was when the bride is to wear conch shell bangles, red and white in color. 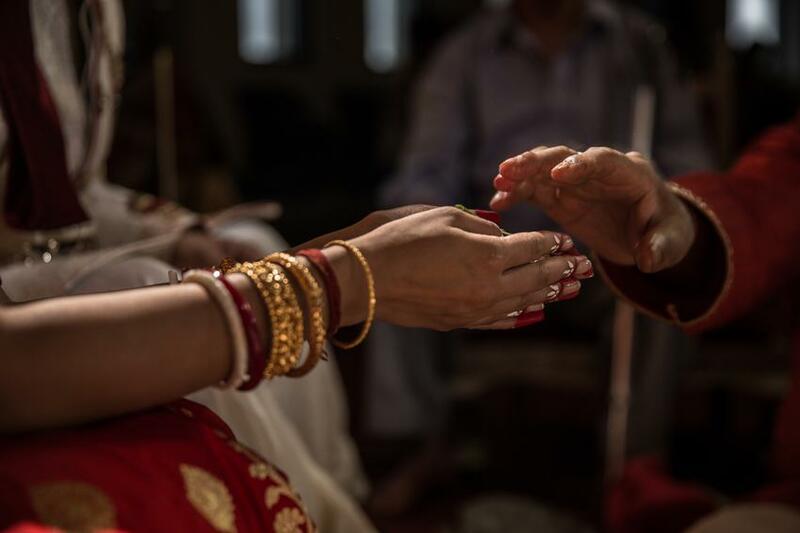 The essence of these bangles is similar to ‘mangalsutra’ that North Indian married women wear. 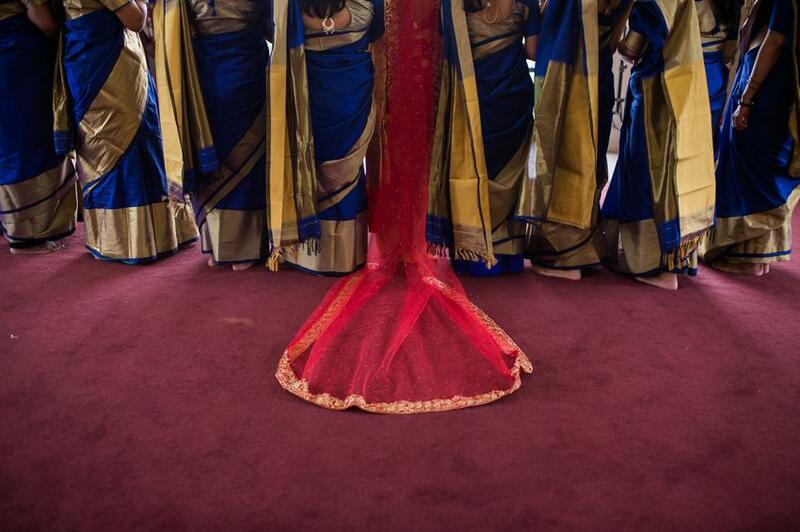 For the wedding day, Smita, the bride wore a traditional Bengali Banarasi sari paired with a long red veil. 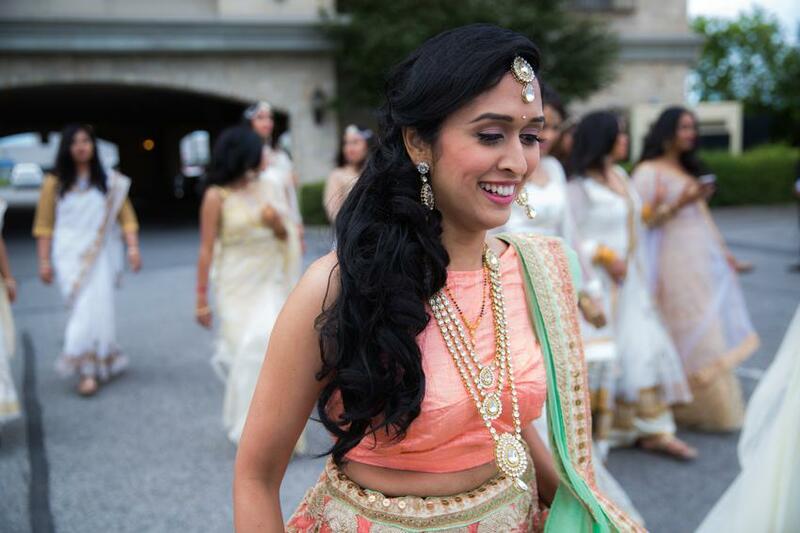 Bridal makeup and hair were by Anokhi Studios. 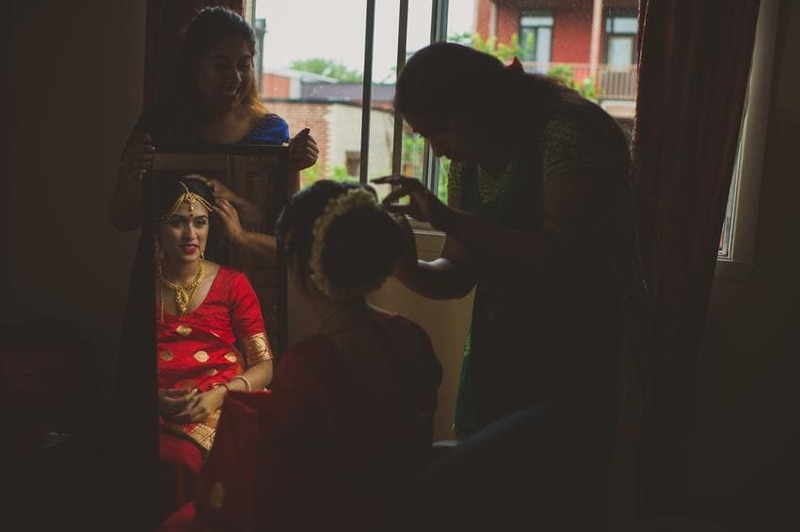 The bride chose to go for minimal makeup, which looked absolutely classy. 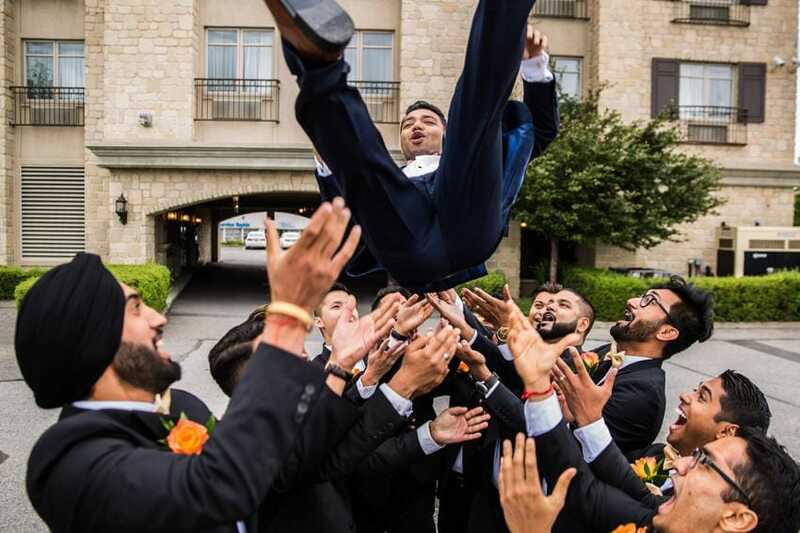 The groom was all set with the help from his groomsmen. 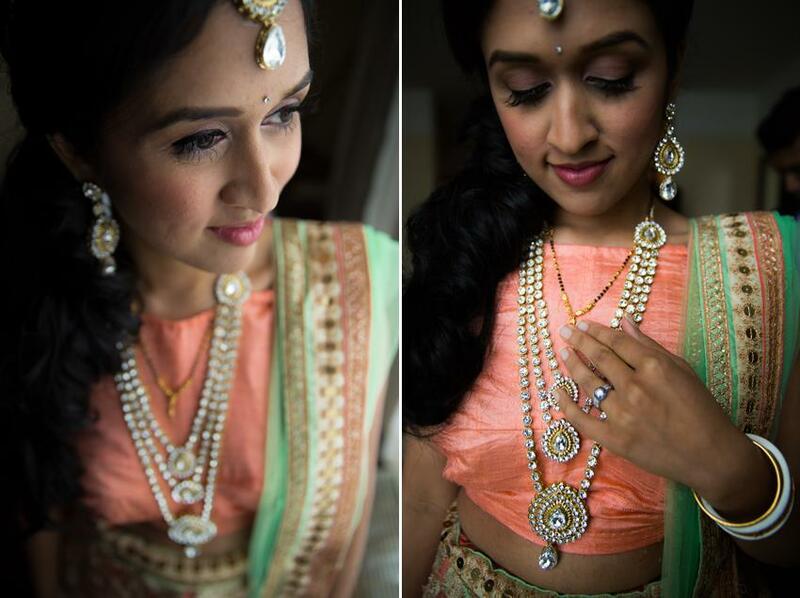 Once the bride was ready, we photographed bridal photos indoors as it was raining. 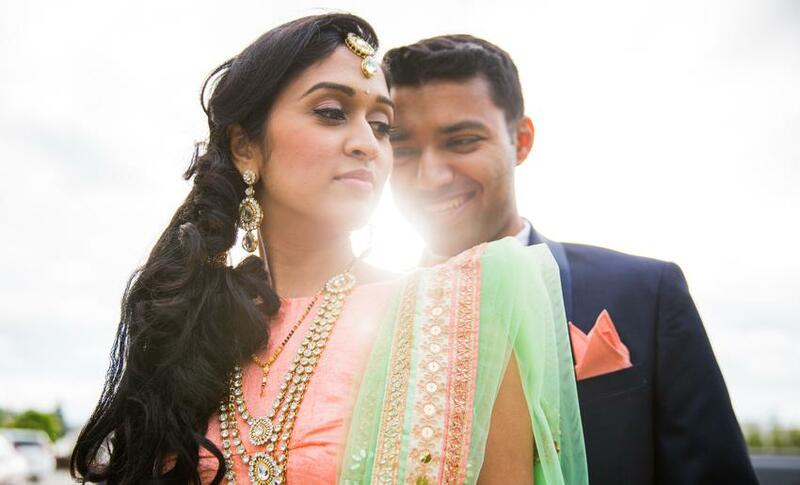 As a wedding photographer, I have learned having a good mix of planning ahead and being spontaneous works the best. 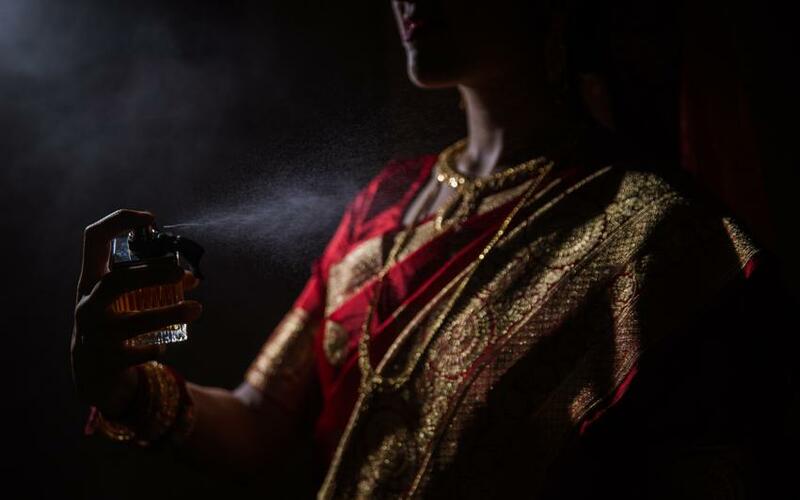 Golden Rule – Rain or Shine, the show must go on! 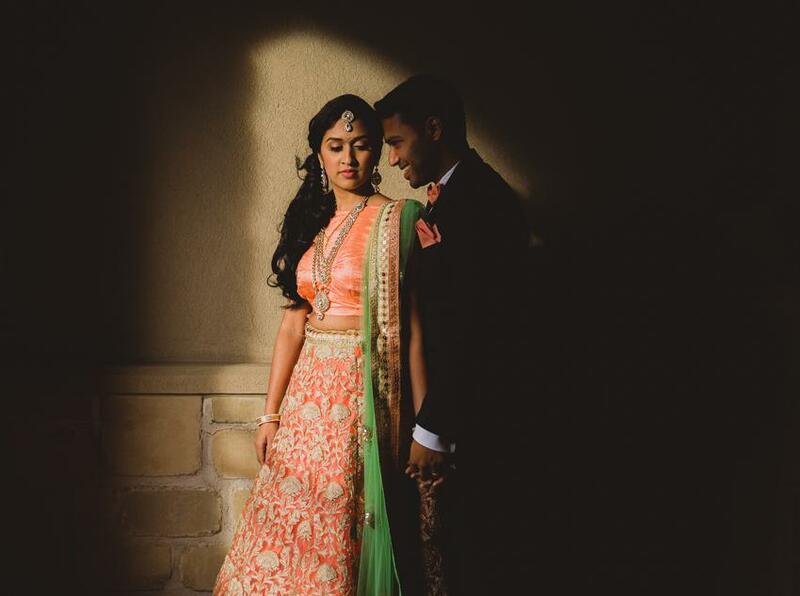 On wrapping up the bridal photo session, we headed to the Mandir. 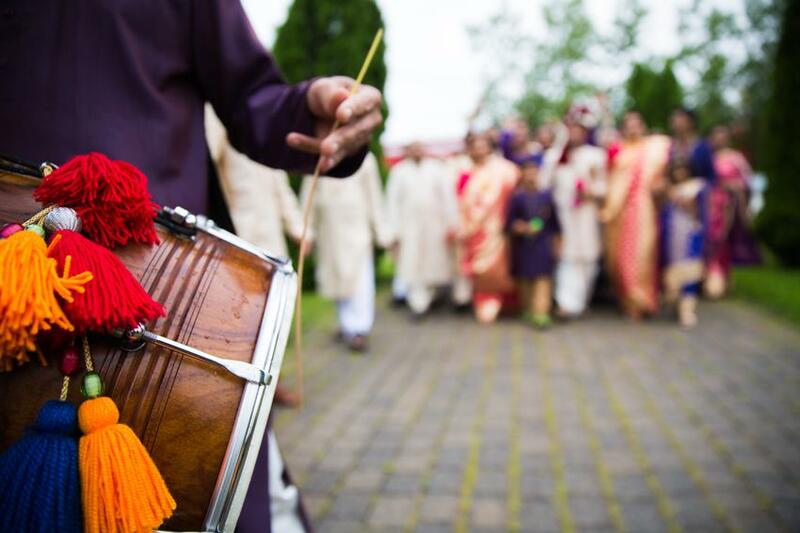 Grooms side of the family arrived at the Hindu Mandir in West Island with drums beating and loud cheers. 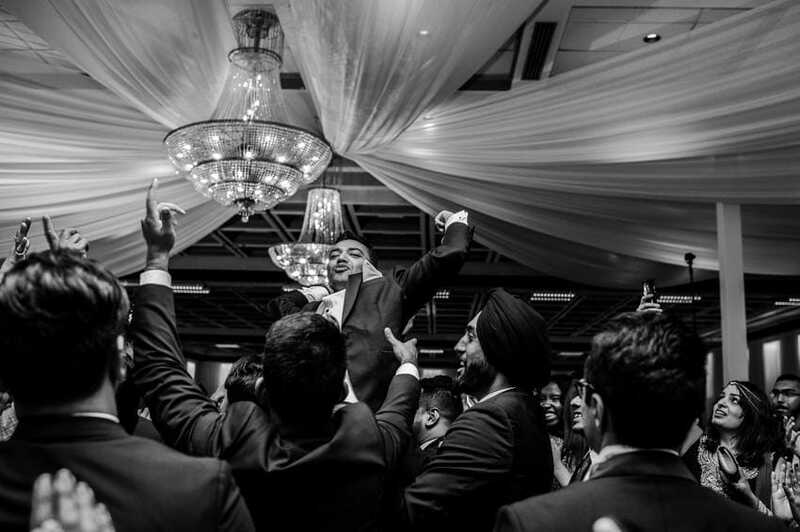 One of the ceremonies in Indian weddings is the ribbon cutting, when the groom makes his entrance. 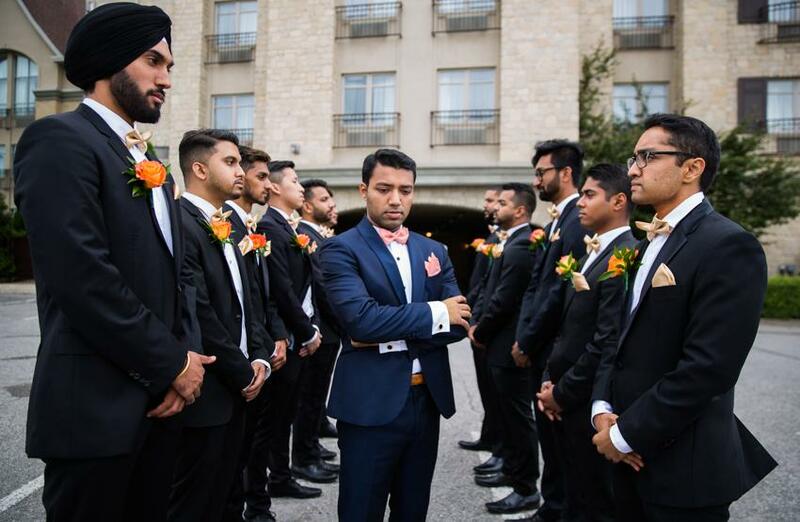 This ceremony was very powerful with 25 energetic bridesmaids and groomsmen trying to make it through. 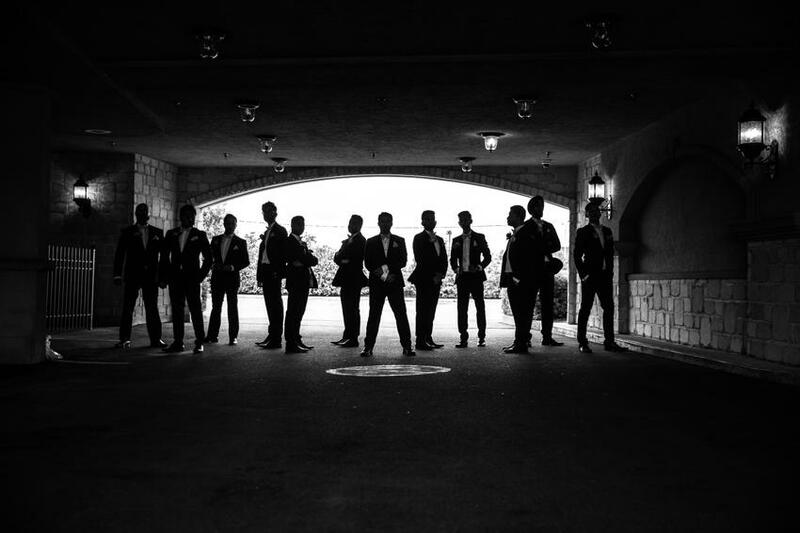 Groomsmen came prepared with party spray cans. 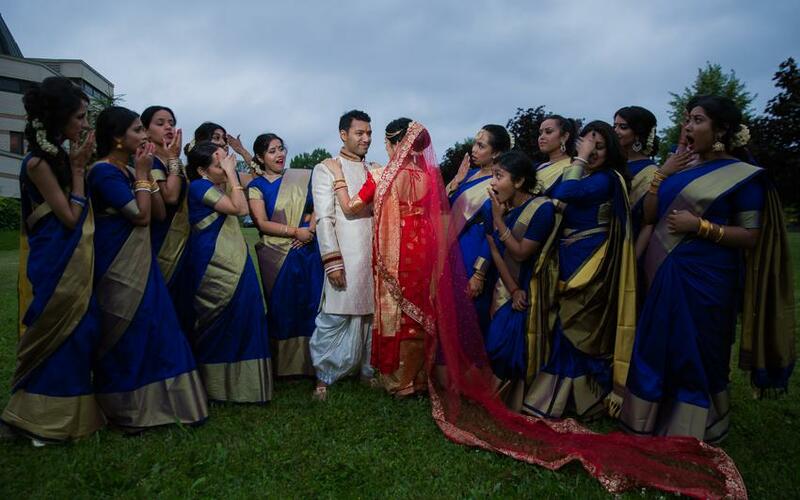 The ceremony progressed with Bengali traditions and the West Island Mandir Hall was packed with family and friends. 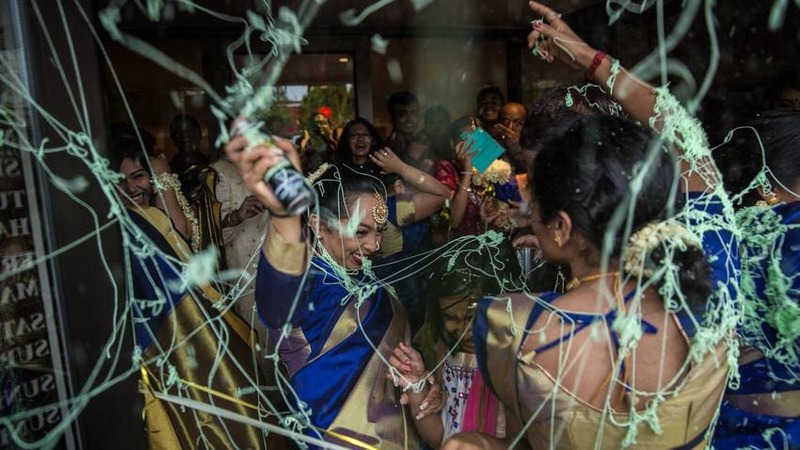 The bride’s mother anointed the groom with tilak and performed aarti to welcome her son-in-law. 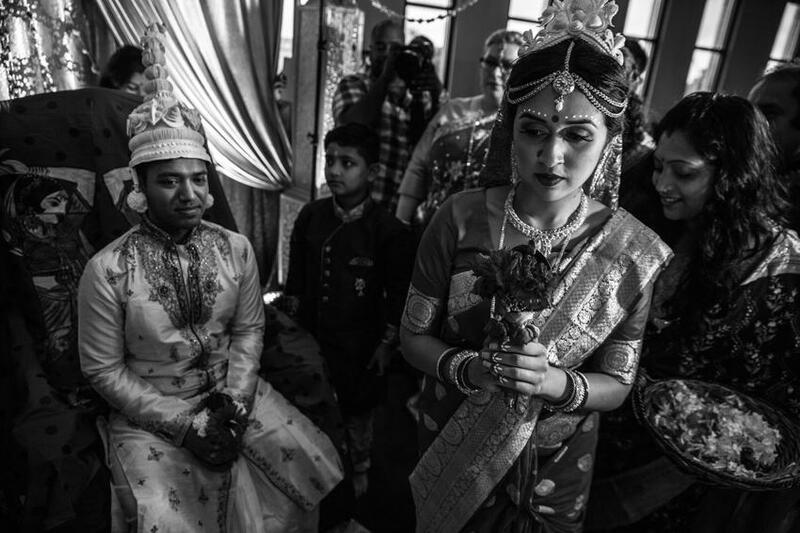 She then performed a traditional Bengali ritual by groom’s hands and offered him new pair of clothings along with a crown for the ceremony. 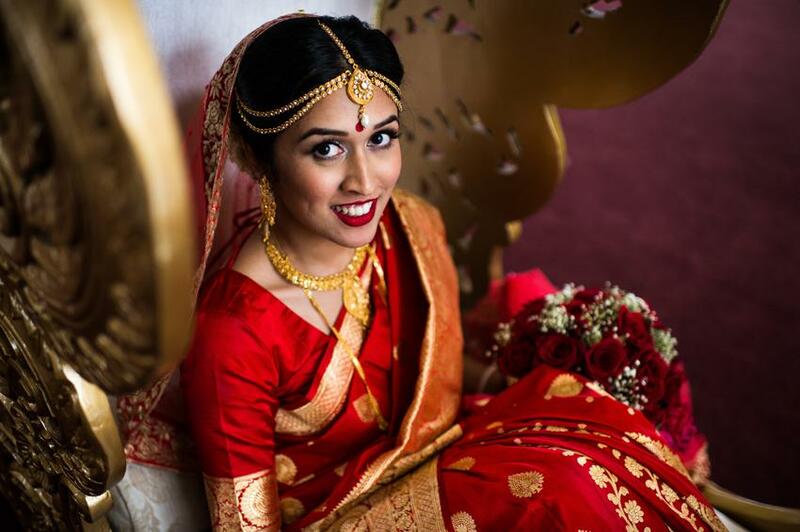 The bride made her entrance on a palanquin, a majestic golden chair, with her eyes covered with betel leaves. 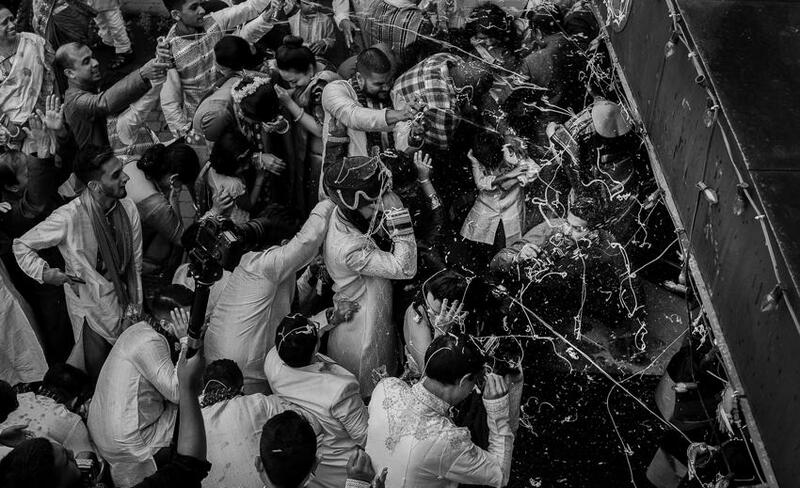 The palanquin was lifted by her brothers. 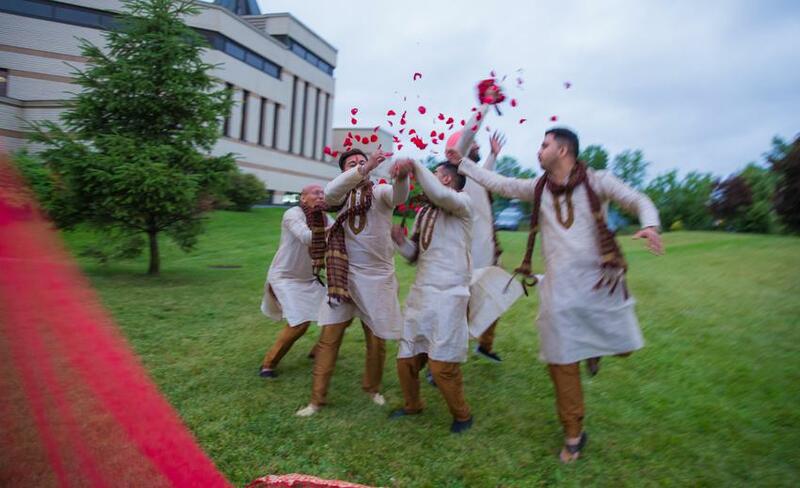 The bride lowered the betel leaves once Saat Paak was completed. 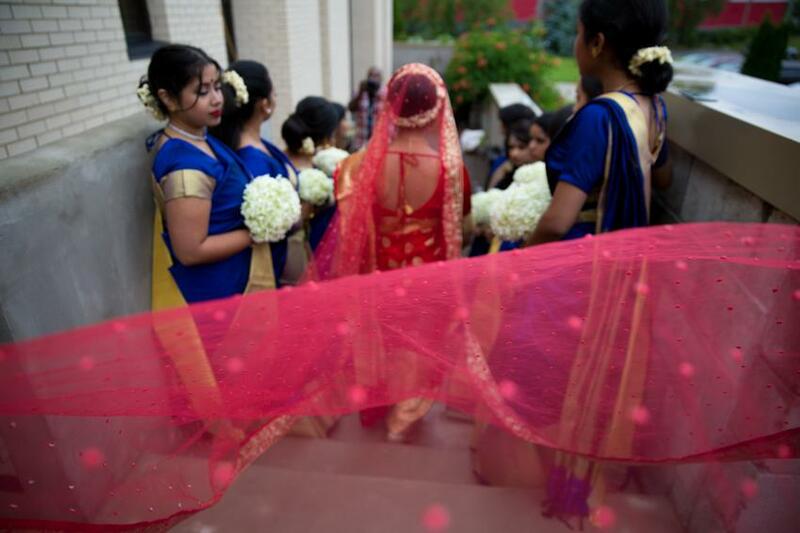 The next ceremony is the exchange of garlands by the groom and bride. 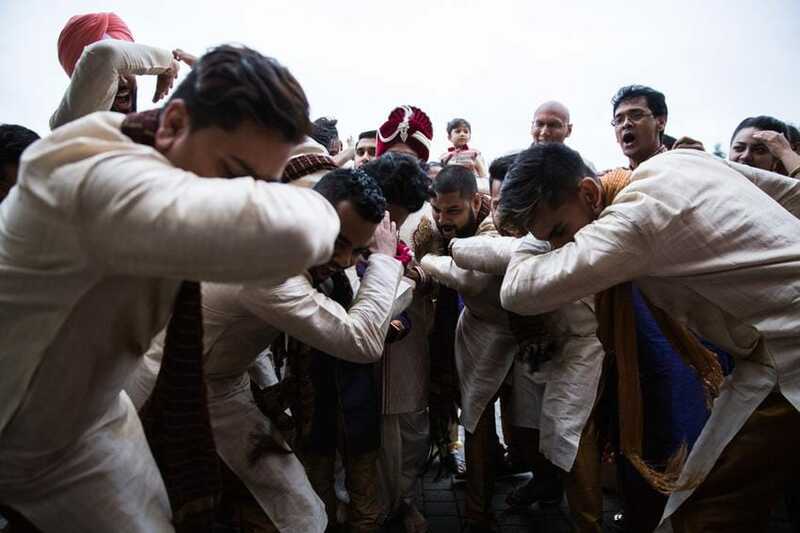 Both side of the wedding party made this ritual cheerful by lifting the two higher, making it difficult to exchange the garlands. 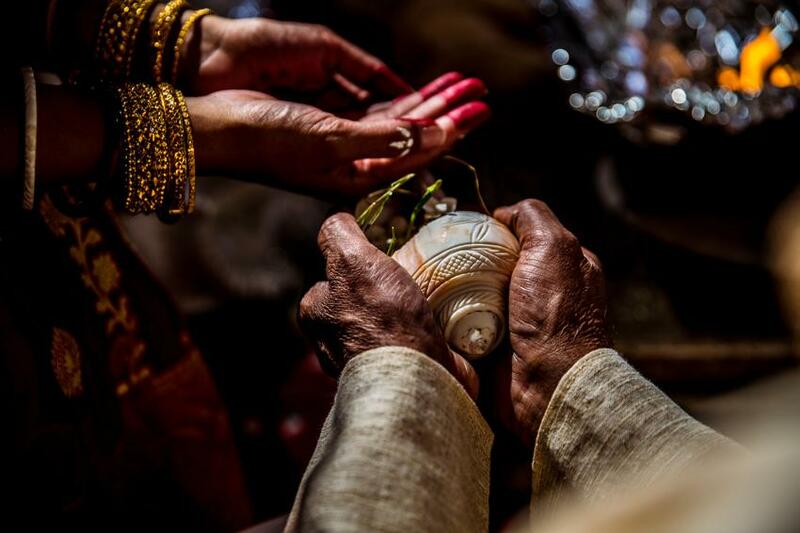 On exchanging the garlands, the bride sat next to the groom, an elderly person of the family then placed the bride’s hand into the groom’s, thereon tying it down with a sacred thread. 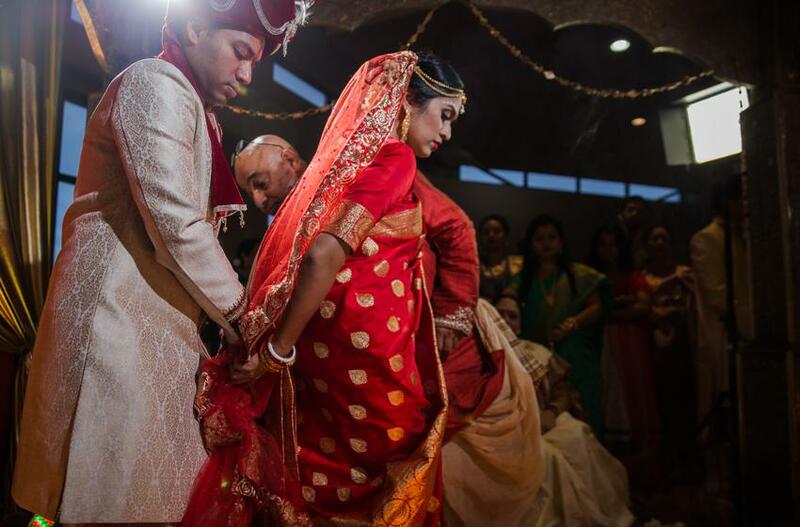 The couple went goes around the Holy Fire to solemnize the marriage, while the priest chanted the wedding vows. 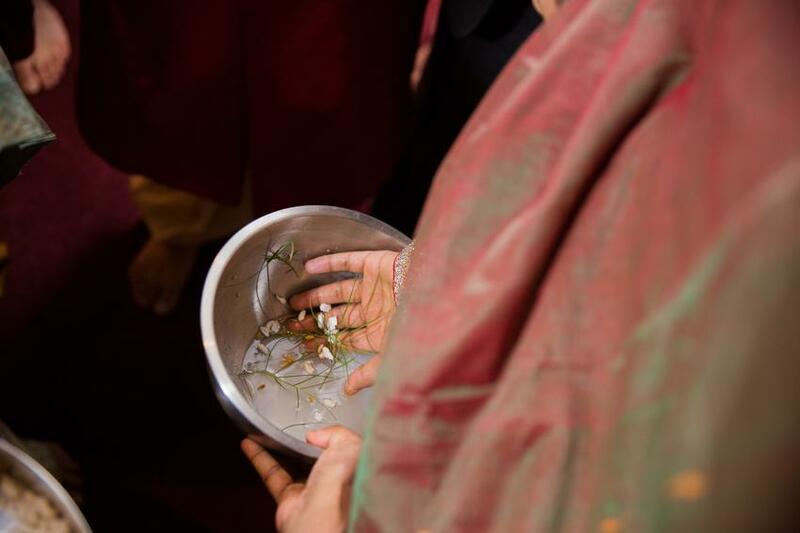 Then the brother -of – the – bride placed puffed rice in her hands which the couple offered it to the Holy Fire. 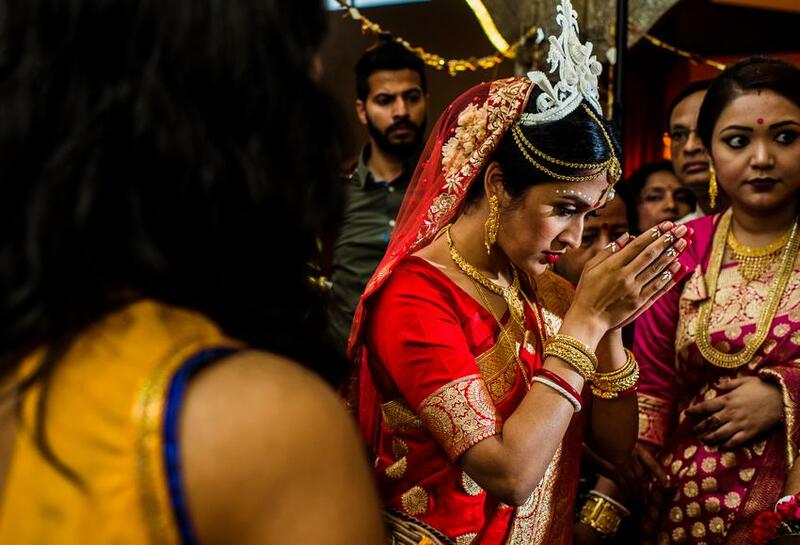 Last part of the ceremony is the Sandoor which is a vermilion mark on the forehead of the bride ; this symbolizes that a Hindu woman is married. 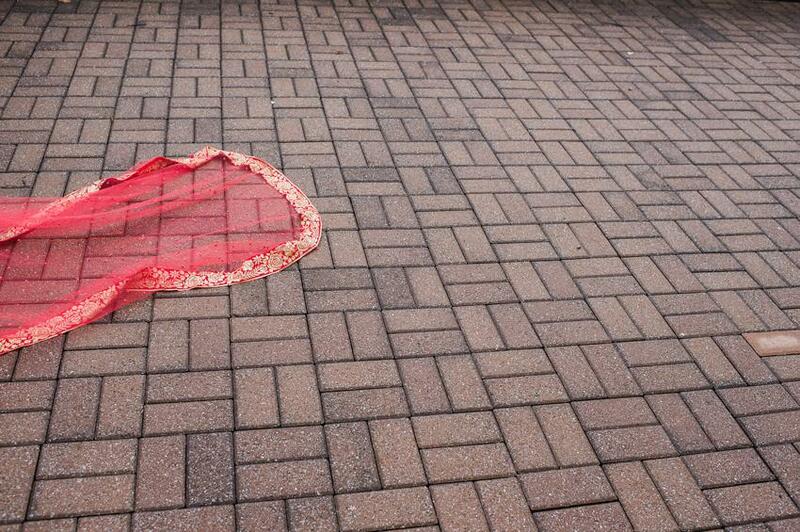 This now marks the end of the wedding rituals. 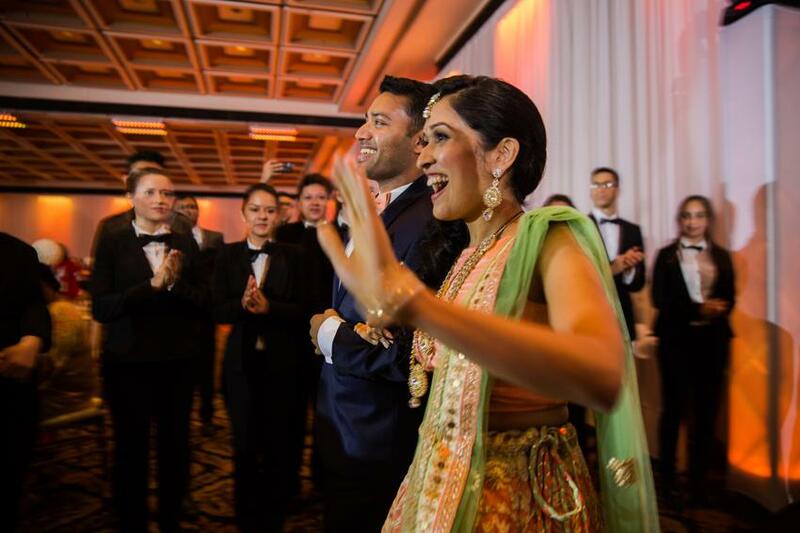 The reception was next day at The Palace (Centre de Congrès Palace), which is one of the biggest venues in Montreal. 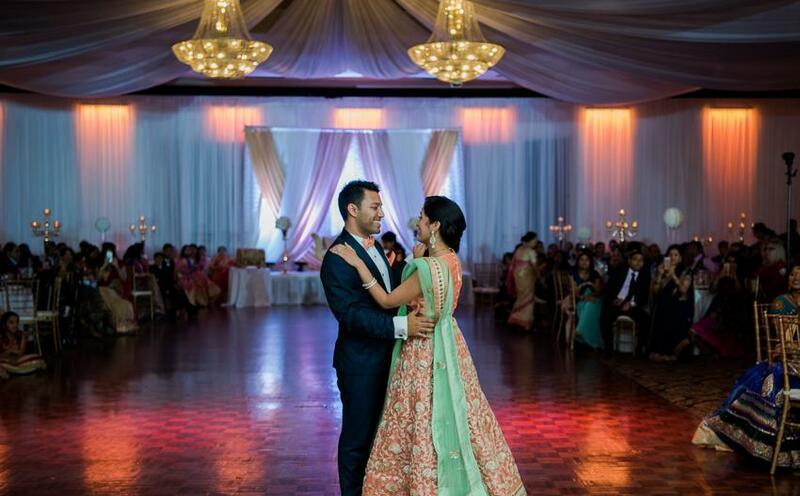 With over 1200 people attending the reception, the lavish Bengali wedding was a royal affair. 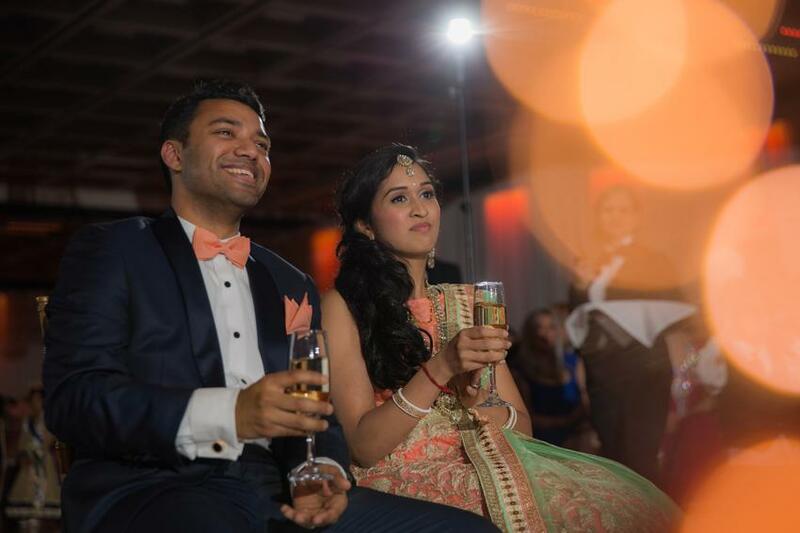 Food for the ceremony was catered by one of our favorites – Dawat Caterers. 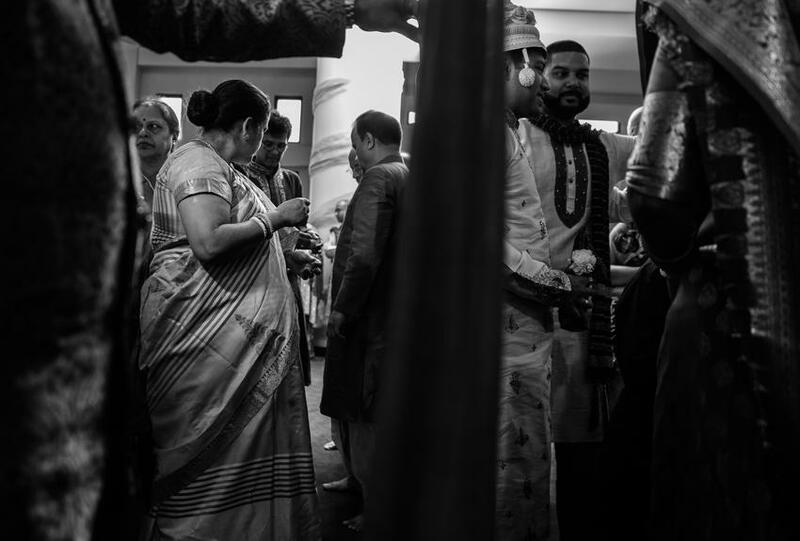 They did a commendable job preparing a traditional Bengali Feast for the guests. 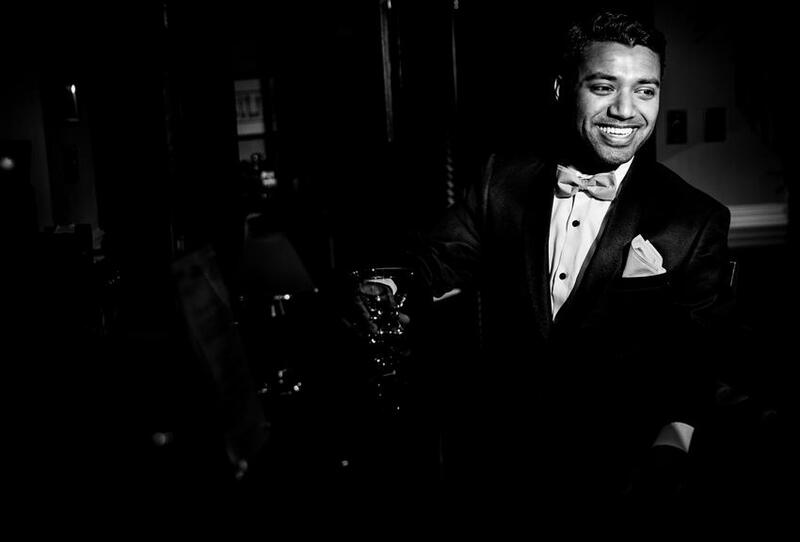 Emcee Girish from Shaadi MC engaged the crowd with his beats while the couple prepped to walk in. 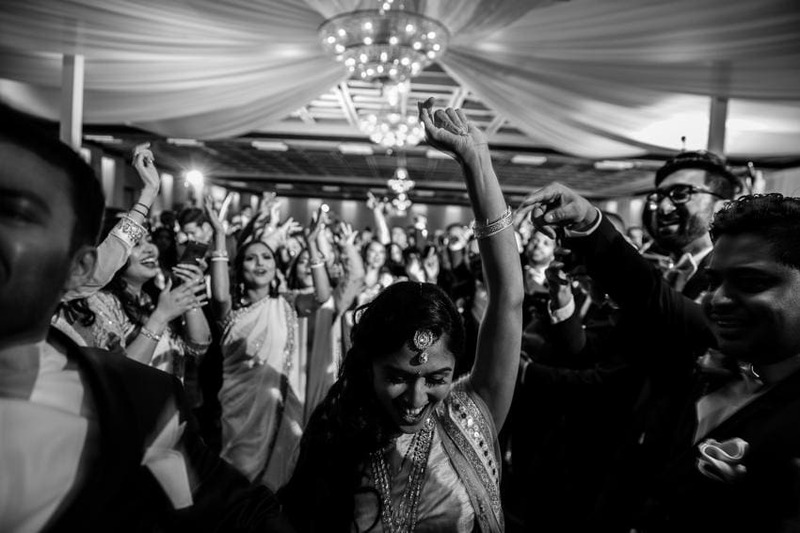 As the couple was announced, the place was nothing short of electrifying energy, with everyone jumping off their chairs and cheering with excitement. 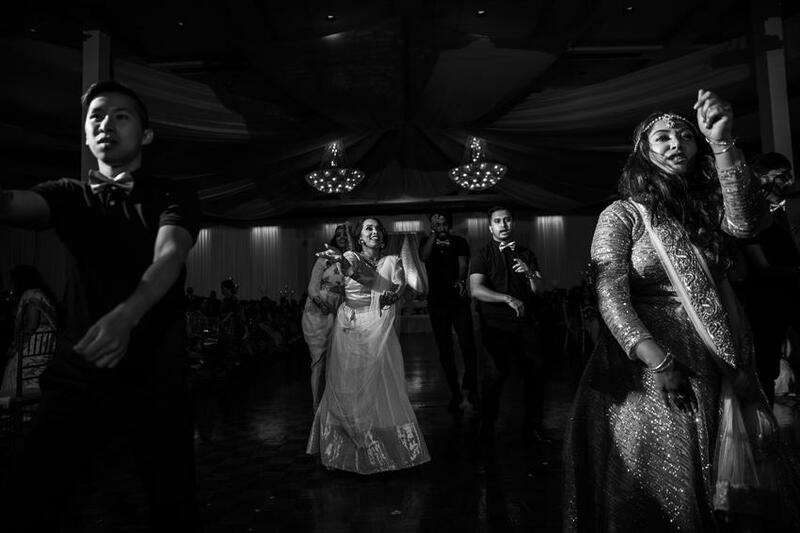 Bengali Weddings are known for their ground shaking dance performances and the night was lined up with traditional dance performances prepared by family and friends. 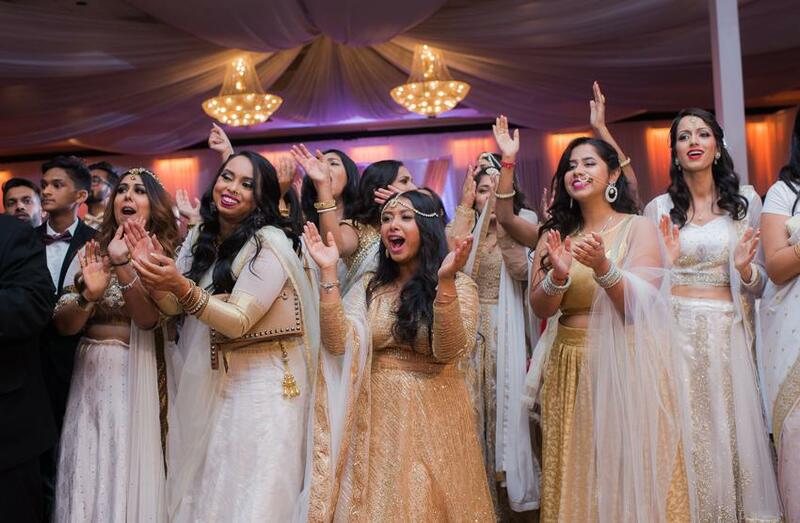 At one point, the bride too joined the performances. 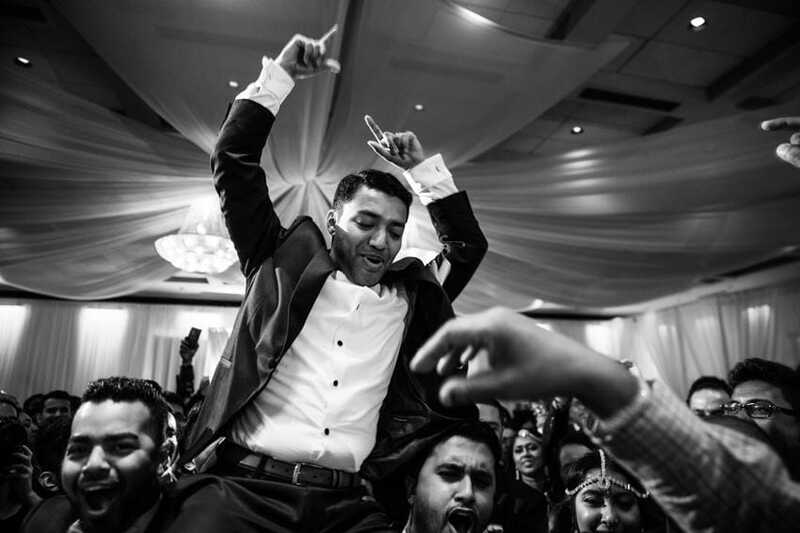 DJ Paul from Jannat Productionz later took the lead, making the night even more special. 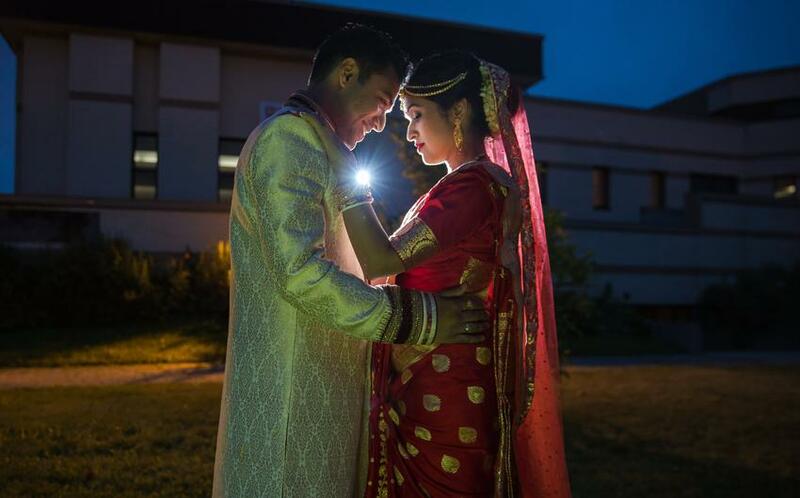 As promised, images were delivered to Smita and Sanjib, eight weeks after their wedding. Here is what they have to say – Review.